Pink to Green: Linnea's Lights Giveaway!!! I'm excited to announce that for the rest of the week, I'll be offering the chance to win some of my favorite things!!! 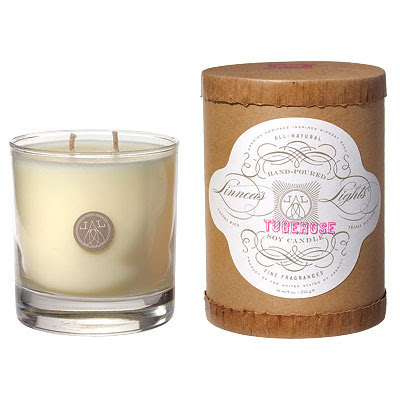 First up, today's giveaway is a beautiful Linnea's Lights Tuberose Candle. To read more about why I love these handcrafted products, check out this post on my favorite eco-candles. As recently featured in InStyle, the Tuberose scent is in honor of breast cancer awareness month. I love my Linnea's Lights candle and I know you will too-- they smell so good, have beautiful recycled packaging and offer up to 60 hours of illumination. To win, please enter a comment below about what you would like to see more of on Pink to Green and your email address so I can get in touch. If you are a follower (you can click the button on the right hand column to join) you may enter two comments. All comments must be submitted by Monday, November 2nd. Winner will be announced next Tuesday the 3rd. Good luck!! Count me in, I love love love candles....I like everything you do, so just keep doing it however you wish! My email is: cathinunn@gmail.com. Have a great day...!! I would love to see more of your home if you're up to showing it. The peeks I've seen so far are lovely! Fabulous giveaway lady! We love everything about your blog but I love when you feature ways to make our personal lives greener. Little tips and DIY on going green are so helpful! I would love to see more recipes, I really enjoyed the granola recipe. It was simple and helpful and saves me money. I too would also love to see more of your home. I like your sense of style and the things you favor interest me. I love how the blog is ran now! I've been wanting to try this candle FOREVER! i'd love to see more reviews and more pics of your home! Love your blog! This is my second comment for being a follower of your amazing blog! I love the candle! 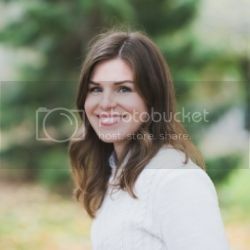 I think your blog is great just as it is! I would love to see more meat-free recipies and some more DIY furniture/home ideas. I love it all, Megan! As you know I already adore your blog. great giveaway. No light is prettier than candle light! I like green tips, new finds and ideas on how to incorporate green living into my home... you have had several fun articles about the green movement, and I would love to see more eco-friendly posts! I would also love to see more of your house. I love your blog! I found it after researching the set of the Funny People movie, as I too was obsessed with the decor :) I have not smelled that candle, so I hope I win!!! OMG!!! you have a great blog! i'm glad I've found you! Would you come to visit me?